• Instantly creates stronger healthier looking hair after just one use. Directions: Apply to damp hair from root to tip. Do not rinse. Great natural hair serum. Very light and love the shine and silkiness it brings to the hair. I absolutely love this product. It's light weight, reasonably priced, and really hydrates and brings a silky shine to my hair. My hair is quite long and thick, but a little goes a long way. Furthermore, I colour my hair and this serum really helps to hydrate and preserve the colour. I love it!! 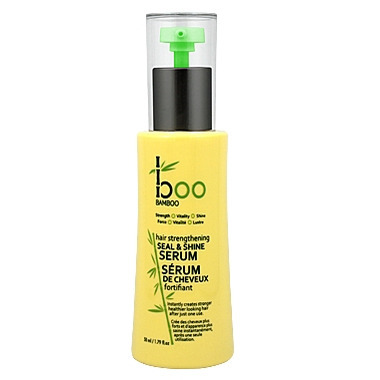 A lovely light weight serum that makes your hair feel silky and reduces tangles, but the bottle is not the best design and can leak while travelling. Absolutely love this product. It works well within hair without it feeling greasy or sticky. It adds shine and smoothness once dried and styled. I will keep going back to this product. I love this serum. I had very long hair for years, and this serum made is smooth, tangle free and shine with health. I applied it to the surface and worked it in loosely than brushed through. If there was a knot, I applied it directly to the knotted part and the strands of hair came away freely. My hair is not long and permed and It really adds shine to my curls plus it helps the curls look amazing. Great product but I have to agree about the dispenser. My cap broke so I have to unscrew it now to put in my hair. I also use the shampoo and conditioner by this brand. The 3 steps combined have made my hair much thicker and it grows very quickly. It is not a bad product, but I find if you leave it in your hair for too long, your hair becomes difficult to manage. I also found the dispenser hard to use. This serum has cured my dry frizzy hair. Works well on the ends however I find it greasy using it from root to end. This product does work on my hair, but it also leaves a very unnatural and plastic-y film on my hands after using it. I've stopped using it because of that and have switched back to the Grapeseed Glossing Serum from The Body Shop. this serum is the greatest serum ever invented, because i was crazy curly hair and they usually get puffy which is annoying. And i got a sample of this serum not too long ago i tried it and my hair was wavy and not curly and my hair was relaxed and more manageable. also this serum makes your hair so healthy looking and shiny. BEST SERUM EVER! I think this product is great. I get lots of shine but my hair doesn't feel weighed-down or oily. Awesome product, great results - no frizz, nice shine without greasy feeling, plus this is not tested on animals. It's my go-to hair product, and I will continue to buy it. Amazing I would continue buying this serum .it gives you a wonderful look after the first use..
Great product, love that it is all natural and Canadian! I also use it for my 3 yr old daughters hair which is super curly and hard to brush. Very small bottle, but you don't need much to make your hair shiny and soft. Less is more, too much and you'll make your hair greasy. I love this product. I have fine hair, and this really makes my hair tangle free, soft and frizz free. It smells terrific and it's not at all greasy. Absolutely love this product , hair feels so soft and I have dry/damaged and over processed her but, You would never know it after using this . I will continue to use this all the time and totally recommend it . this is amaaazing!!! ..i have used everything from coconut oil and argon oil to biosilk (which is my next fave) and this stuff def outdoes the rest!! LOVE! !